CoolerMaster isn’t necessarily known for its gaming keyboards. I mean, it’s not called KeyboardMaster, is it? No, that’s the name of Rick Wakeman’s criminally under-read autobiography. And that’s a shame – not being known for gaming keyboards, I mean, rather than some obscure reference to a made-up autobiography of a man I’m not even sure is himself actually real. Whatever. In a world where most gaming hardware has latterly been sharply angular, over-designed, and all kinds of grotesquely over-the-top, CoolerMaster has regularly favoured a more subtle design for its peripherals. And that’s why we’ve become rather big fans of its minimalist keyboards, and most especially its compact keebs. If you want the finest in gaming boards we’ve picked out the best mechanical keyboards just for you. 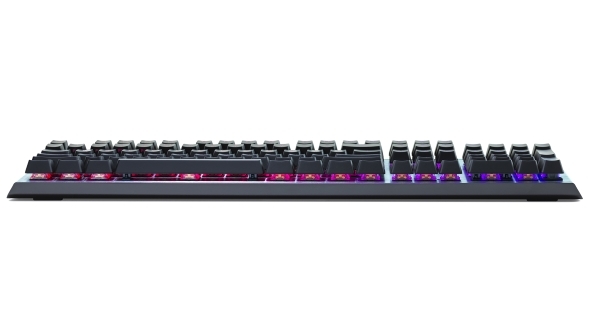 The latest CoolerMaster board, the CK550 follows in the fine tradition of its straightforward MasterKeys design, with a simple, robust layout, RGB lighting, and geniune mechanical key switches. What CoolerMaster has done, however, is create all this with a genuinely affordable price tag. Okay, it’s not cheap but it’s not going to break the bank either. 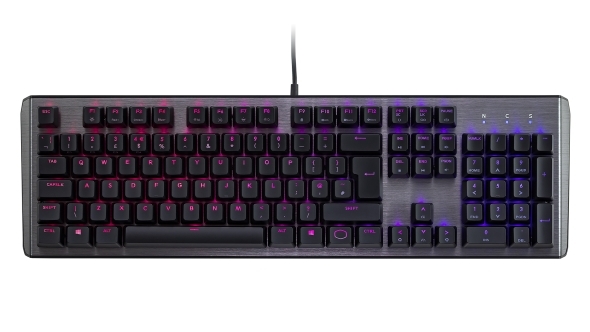 So how has CoolerMaster managed to bring genuine mechanical switches down into a more affordable price, but still been able to offer a brushed aluminium finish and per-key RGB LED lighting? It’s largely because it’s not using the traditional Cherry MX switches, which are reportedly becoming harder and pricier to source for keyboard manufacturers. All of CoolerMaster’s other mechanical switch gaming keyboards have come with Cherry MX switches, but for the CK550 it has made the switch (teehee) to Gateron for this board. The sample we’ve been testing is using the Gateron red switches, which, it should come as no surprise, operate in pretty much the same way as Cherry MX Red switches. There are also brown and blue versions, which are again direct analogues of the Cherry switches of the same colour. They have the same actuation point, actuation force, and travel distance as the Cherry versions, but do feel every so slightly different. To me the Gateron reds feel a little lighter to the touch, and seem to me to actuate a little quicker. They almost feel more like the Cherry MX Speed switches, but there is always some margin for error in the actuation point of a mechanical switch, so the specified 2.2mm point could actually be plus or minus 0.6mm in the final manufacturing reckoning. But either way, the keys feel solid, and don’t have that loose feel some non-Cherry alternatives other, more price-conscious, mechanical switch boards use. And, unlike RGB-based Cherry keys, the individual LEDs stand proud of the switch housing, which means they can be brighter and offer more of a pleasing glow around the base of the board. With the key caps almost floating above that brushed aluminium frame you get a really quite lovely halo effect shining from the board. And there are a lot of effects too. There are a host of on-board RGB effects you can light your CK550 with, all accessible via the Fn keys. 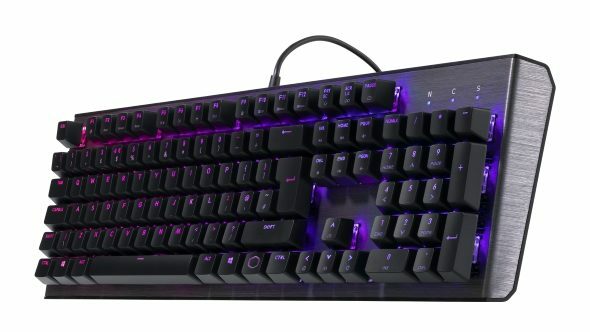 That’s long been a standard feature with CoolerMaster keyboards, but with the CK550 it’s also offering the second outing of its RGB lighting software. It’s relatively simple stuff, and gives you even more control over the kinds of effects you want operating on your board, and what colours you want to use. There are more LED modes than I’ve seen on a lot of high-end boards, and with the Gateron switches’ exposed LEDs they can look incredibly vibrant. You can, of course also dial it back, so it’s more subtle, or even non-existent. You also have access to a host of macros, macro recording, and even switching the key map to reassign individual keys in a given profile. Like the simple, no nonsense design, the CK550’s software doesn’t mess about. 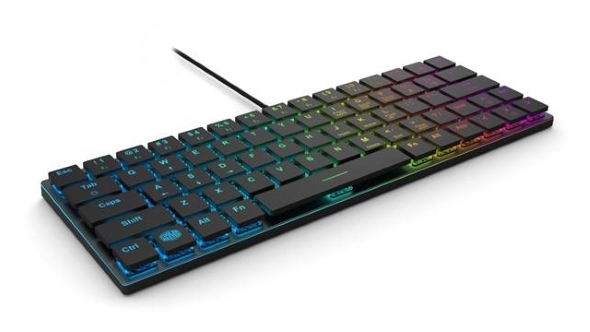 I was very taken with the style of the SK620 I saw out at Computex a few weeks back, unfortunately those super minimalist boards aren’t coming until the start of next year. And, in the face of that, I was honestly not expecting to be as enamoured with this more basic, lower-end CK550 board. But I genuinely can’t help but love it. The design is simple, but that solid, curved metallic base looks fantastic – frustratingly better than these pictures make it look – and the RGB lighting is bright and easily controllable via the software or on the board itself. I’m also impressed with the Cherry MX clone Gateron switches too, they may feel lighter to me, but they don’t in any way feel flimsy. CoolerMaster has done a great job with this gaming board. It has continued with it’s clean design approach, and has created an affordable peripheral that has nearly all the features of far more expensive options, but with all the functionality. Sure, there’s no plush wrist-rest for Jacob to go gooey over, and I miss the discrete media keys – particularly volume control – but the CK550 is still a truly impressive new board. The CoolerMaster CK550 then is one of the best, best-value gaming keyboards around.